This article is about the specific type of comic. For the service, see Line Webtoon. Webtoons (Hangul: 웹툰) are a type of webcomic that originated in South Korea. While webtoons were mostly unknown outside of the country during their inception, there has been a surge in popularity internationally thanks in great part to most comics being read on smartphones. As digital comics have emerged as a popular medium, print publication of manhwa in South Korea has decreased. The amount of material published in webtoon form has now reached an equal amount as that published offline. There are three things that sets webtoons apart from regular comics and webcomics: each episode is published on one long, vertical strip (making use of an infinite canvas rather than multiple pages so that it is easier to read on a smartphone or computer); they will most likely be in color rather than black-and-white since they are rarely published in physical form; and some will feature music and animations that play during each chapter. In the case of South Korea, there are also different censorship laws for materials published online than in print which has led to more manhwa that is pornographic in nature being produced and published as webtoons. Like other online publications, there are a variety of payment models used for webtoons. Some offer a limited set of chapters for free and charge for the rest. Others allow only a certain number of chapters to be read per day without payment. The Korean web portal Daum created a webtoon service known as Daum Webtoon in 2003 and was later followed by Naver with the launch of Naver Webtoon in 2004. These services regularly release webtoons that are available for free. According to David Welsh of Bloomberg, comics account for a quarter of all book sales in South Korea, while more than 3 million Korean users paid to access online manhwa and 10 million users read free webtoons. As of July 2014[update], Naver had published 520 webtoons while Daum had published 434. Since the early 2010s, services such as TappyToon and Spottoon have begun to officially translate webtoons into English while some Korean publishers like Lezhin and Toomics have begun to self translate their works. Examples of popular webtoons that have been translated into English are Lookism, Untouchable, Yumi's Cells, Tales of the Unusual, The God of High School, Noblesse, and Tower of God. In recent years, these webtoons have been gaining popularity in Western markets, rivalling Japanese manga. Layout of an early webtoon. Buttons allow turning the page. The earliest webtoons were scanned original comics uploaded onto the Internet, usually formatted on a one-page layout. With the development of technology, authors were able to utilise flash animation effects. An example of a second generation webtoon. Enhanced preloading enabled later authors to adopt a vertical layout with scrolling. In contrast to comics with a dense panel composition, scrolling brings new panels into view. This makes webtoons suitable for gradual and continuous representation, allowing webtoon reading to become more fluid. With the advent of the smartphone and tablet, webtoons have also migrated to new platforms such as apps. Prior to 2014, most webtoons were only available in English through unofficial fan translations. In July 2014, Naver subsidiary Line began publication of translations of popular webtoons to English via the Line Webtoon service. The market for webtoons and their derivatives is currently valued at around KR₩420 billion (US$368 million). Although digital comics are increasingly popular, print publication remains the primary means of comic retail. Some publishers offer online content and print content simultaneously. Webtoons have been taken as source material by a number of different mediums, including film and television; one of the earliest examples of this was 'Tazza, a 2006 film based on the comic by Huh Young-man. This work was serialized in the Sports Chosun and garnered over 100 million homepage views, later being adapted into two films. (Tazza: The High Rollers, Tazza: The Hidden Card), and one television series (Tazza (TV series)). Another of Huh's works, Sikgaek (Le Grand Chef), was published in the Dong-a Ilbo for five years and sold 540,000 copies in paperback version. Naver's Line Webtoon service, launched in 2014, is now the biggest webtoon platform in Korea. According to Naver, it reaches over 6.2 million daily users. The free Line Webtoon translation service has allowed webtoons to form part of the global Korean Wave. They also collaborate with movies. The webtoon format has also expanded to other countries with many different distributors offering original and translated webtoons for users to read as well as offering platforms for anyone to upload their own webtoons. In mainland China and Taiwan, webtoons along with web manhua have seen an increase in production and popularity since they are rarely published and just like in South Korea, have resulted in a resurgence and interest in the manhua industry as more content is consumed digitally. Almost all of the big webtoon portals in China are offered by the big internet companies in the country while in Taiwan the bigger webtoon publishers outside of the country like Comico, Toomics, and Line Webtoon are more popular since their services are available there. Indonesia and Thailand have become big markets for the webtoon industry with both Naver (under Line Webtoon) and Comico offering both original webtoons and fully translated titles in the two countries. Some webtoons made in Indonesia and Thailand have even been translated and published outside of the countries like Eggnoid. Vietnam launched its first webtoon portal, Vinatoon, offering translated titles from Daum Webtoon and Mr. Blue with the intention of opening up another market. Many of the webtoon publishers have had success in penetrating markets outside of Asia with the biggest success being the United States and other English speaking countries. Lezhin, Toomics, and Naver are the only big publishers who translate their own titles rather than licensing them out and Naver (under the Line brand) even offers the ability for fan translations to be offered in different languages. Spottoon and TappyToon offer translated licensed works from various publishers including KToon, Bomtoon, Foxtoon, and many more. Besides just the consumption of translated works, there has also been a rise in the creation of original non-Asian webtoons thanks in part to sites like Tapas and Line Webtoon offering the ability for anyone to submit their own work. In the beginning, many of the webtoons created outside of Asia tended to just be webcomics released in the webtoon format but over time, more artists have released more titles that are full-fledged comics rather than reformatted webcomics. Webtoons in Japan have not caught on as well as in other countries mainly due to the traditional manga industry still being the main way in which manga get released and published. Even web manga, which have seen a recent rise in populartiy, get released in black-and-white and not color like in Korea or China despite being released digitally. Despite this, there have been some strides to penetrate the Japanese market and slowly more mangaka are trying out the webtoon format to release their titles. Lezhin, Comico, Naver, and Kakao offer webtoon portals with translated works for Japanese readers. Comico, one of the biggest webtoon publishers in the world, was actually created by the Japanese subsidiary of NHN Entertainment, NHN Japan. To date, there are only two webtoon portals that offer original Japanese webtoons, Comico and Naver (under the name XOY). Kakao has also had success in the Japanese market by offering both licensed manga and translated Korean webtoons with their service, Piccoma. This has been credited to the webtoon pay model that the service implements where some chapters are offered for free for a short period of time. Kakao Japan has announced that it will start offering original Japanese, Korean, and Chinese webtoons for Piccoma in the summer of 2018. ^ Noh, Sueen. ""To Be or Not to Be, That Is the Question": What Is Happening with Korean Comics, (Manhwa), Today?" International Journal of Comic Art (IJOCA) 9.2 (2007): n. pag. International Journal of Comic Art (IJOCA). John A. Lent, Sept. 2007. Web. 3 Dec. 2015. ^ Herald, The Korea (2014-05-25). "Korean webtoons going global". www.koreaherald.com. Retrieved 2016-04-27. ^ Welsh, David. "Forget Manga. Here's Manhwa". Bloomberg.com. Retrieved 2016-04-27. ^ Lee, Jun-Youb (2015-04-03). 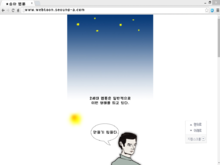 "Startup Battles Naver in English Webtoons". The Wall Street Journal. ^ "[다시 도전이다] 미생·스틸레인 웹툰작가들, 美·中 독자도 웃고 울린다". Wow TV. 2015-01-01. ^ Han, Chang-wan (2012-06-30). 애니메이션 연구6(Animation studies6). 한국 애니메이션 학회(Korean cartoon and animation studies). pp. 124–139. ^ "Popular Mobile Webcomic Service, LINE Webtoon, Debuts in the United States and Worldwide". PRNewswire. Retrieved 16 August 2014. ^ "Korea's webtoon market experiences exponential growth over past 10 years". Arirang News. Retrieved 16 August 2014. ^ "South Korean 'webtoon' craze makes global waves | The Japan Times". The Japan Times. Retrieved 2015-11-30. ^ Choi, yun cheol. "2009해외콘텐츠 시장조사(2009 abroad contents market research)". www.kocca.kr. 한국콘텐츠진흥원(Korea creative contents agency). ^ Song, Jung-Eun; Nahm, Kee-Bom; Jang, Won-Ho (2014). "The Impact of Spread of Webtoon on the Development of Hallyu: The Case Study of Indonesia". 한국엔터테인먼트산업학회논문지. 8 (2): 357–367. Retrieved 2015-04-08. ^ "영화를 웹툰으로 미리 본다? 영화X웹툰 콜라보의 세계". Cineplay. 2017-08-14.